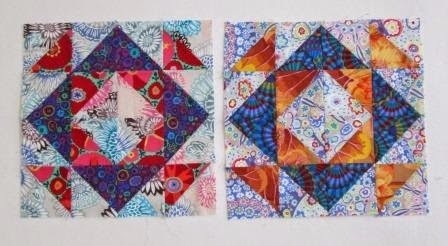 I have another set of 2 blocks done for the KFC Block Exchange group (Kaffe Fassett Collection). I got then in the mail this past hour in fact. I have 1 more set of blocks to do and then I am done with block exchanges for a little while. Well maybe. There is talk of doing some kind of block exchange or block of the month with the Leduc Black Gold Quilt Patch. I might have to do that one.